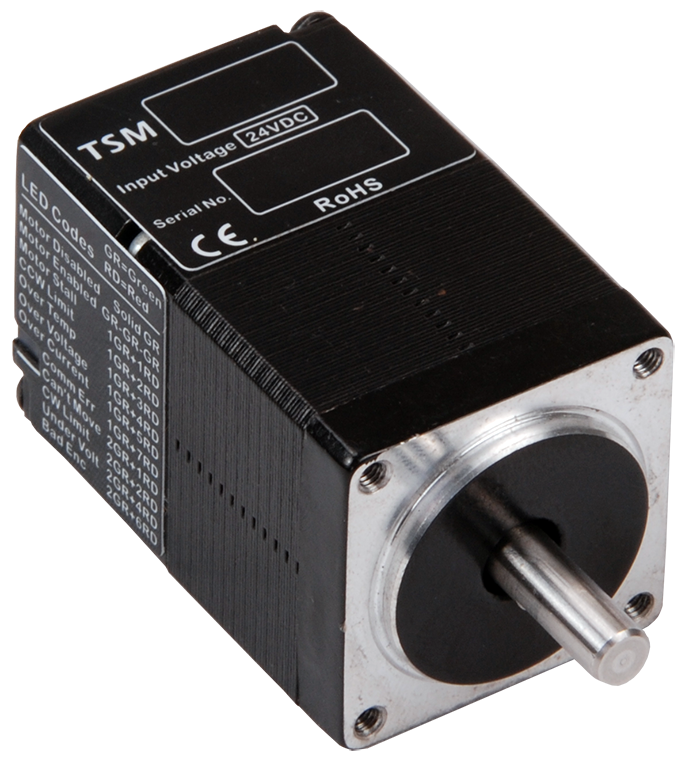 The TSM11Q-1RM StepSERVO™ integrated motor is a drive+motor unit, fusing NEMA 11 step motor and servo drive into a single device. Power to the drive, located at the rear of the motor, must be supplied by an external DC power supply. See the Recommended Products below for a compatible 24 volt supply. StepSERVO™ technology combines the high torque capabilities of a step motor with the closed loop dynamic control of a servo system. The result is an all-in-one motion control solution that operates quietly and efficiently, requiring only the minimum amount of current to maintain commanded position and velocity. Boost torque of 25-50% higher than rated holding torque increases the limits of acceleration, leading to faster cycle times. StepSERVO integrated motors can be applied in systems where a traditional stepper motor would not be capable of achieving the high accuracy required. 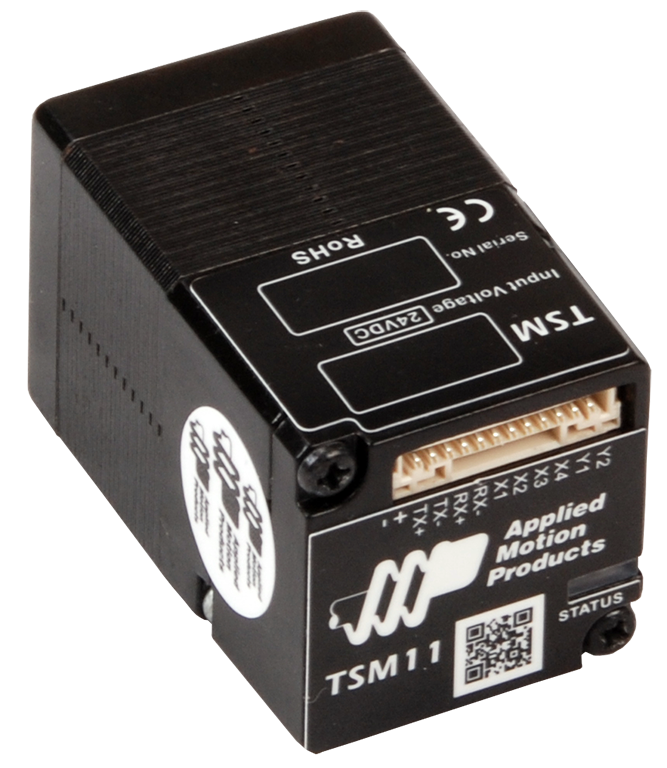 The TSM11Q-1RM can be operated in several different control modes, including Streaming Commands using SCL or Modbus RTU, Pulse & Direction, and Velocity modes; plus it has the ability to run a Q program stored in non-volatile memory. Q programs are created using Applied Motion's Q Programmer™ software, which provides powerful commands for motion, I/O, conditional processing, multi-tasking, math functions, and more. All TSM11 integrated motors are configured and tuned using Applied Motion’s Step-Servo Quick Tuner software with built in Q Programmer. 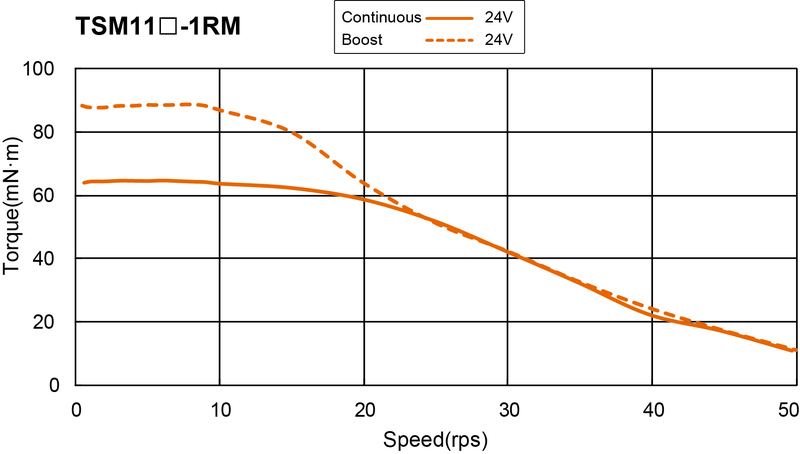 Each TSM11 integrated motor comes with 4 high-speed (1 MHz) digital inputs and 2 digital outputs. The digital inputs accept signals of 5-24 VDC and can be used for connecting pulse & direction signals, end-of-travel limit switches, quadrature encoder signals, PLC outputs, sensors, or many other signal types. The digital outputs can be connected to PLC inputs, counters, lights, relays, or other devices. The TSM11Q-1RM comes with an RS-485 port for programming and serial communications to allow for the use of either Modbus RTU or Applied Motion's Streaming Command Language (SCL). An integral 4,096 count/rev (magnetic) incremental encoder is housed inside the same enclosure as the drive electronics and used for closed-loop servo control to attain highly accurate position and velocity control. Encoder counts can be accessed over the network or from within the Q program using SCL registers. 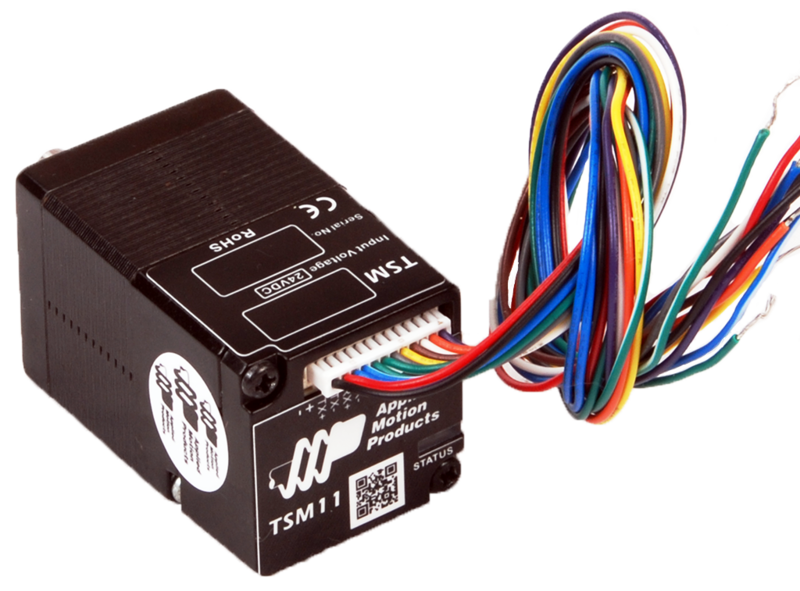 The standard TSM11Q-1RM integrated motor has a single connector at the back of the motor for power, I/O, and RS-485/Modbus communications. A version of this motor with three separate connectors - one connector for power and I/O, one for RS-485 IN, and one for RS-485 OUT - is also available. The three connector arrangement facilitates easier connections for daisy-chained RS-485 and Modbus RTU networks. See the TSM11Q-1RM-H01 for details. Also, a standard TSM11Q-1RM can be converted in the field from one connector to three by installing the 8500-005 daisy-chain connection board kit (see Recommended Products below). This kit comes pre-assembled to the motor when the "-H01" version is ordered.